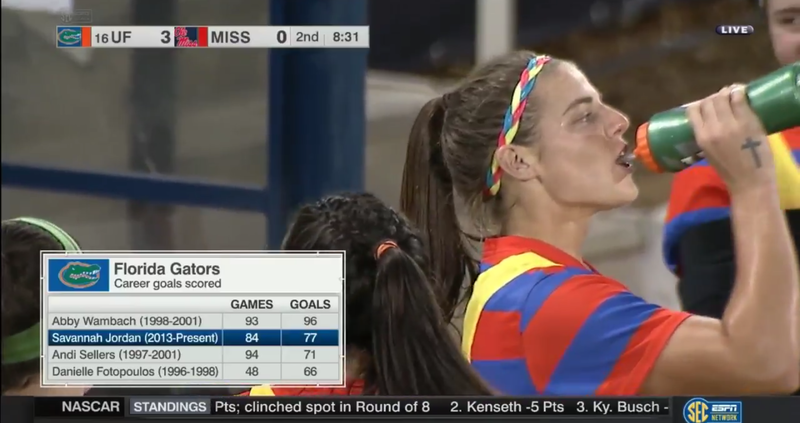 OXFORD, MI- Savannah Jordan led the Florida Gators soccer team to a SEC victory against Ole Miss. Jordan scored two goals as fellow senior Pamela Begic added one for the Gators. The Gators improved to 10-3 and 5-2 in SEC play. The Rebels fell to 8-7 and 3-4 in SEC action. For her efforts, Jordan was named the SEC Offensive Player of the Week on Monday. Jordan scored a pair of goals in each contest last week. Against Georgia on Thursday, Jordan scored off a penalty kick and added another goal late. Jordan now has 77 career goals, moving her to twenty-fifth in NCAA Division I history. Jordan has now earned the award eight times in her career. Jordan leads the SEC with 12 goals and 31 points. Savannah Jordan scored just six minutes and twenty five seconds into the match after receiving a pass from Samantha Chung. This is the second fastest goal by Florida this season, as Jordan scored in the third minute against UCLA earlier this season. Pamela Begic added a goal in the 40th minute as she headed in a cross by Melanie Monteagudo. Jordan scored again in the 59th minute after beating the Ole Miss keeper to the right side of the net. Florida outshot Mississippi 13-4 including 10-2 in the first half. Kaylan Marckese made two saves en route to a shutout.